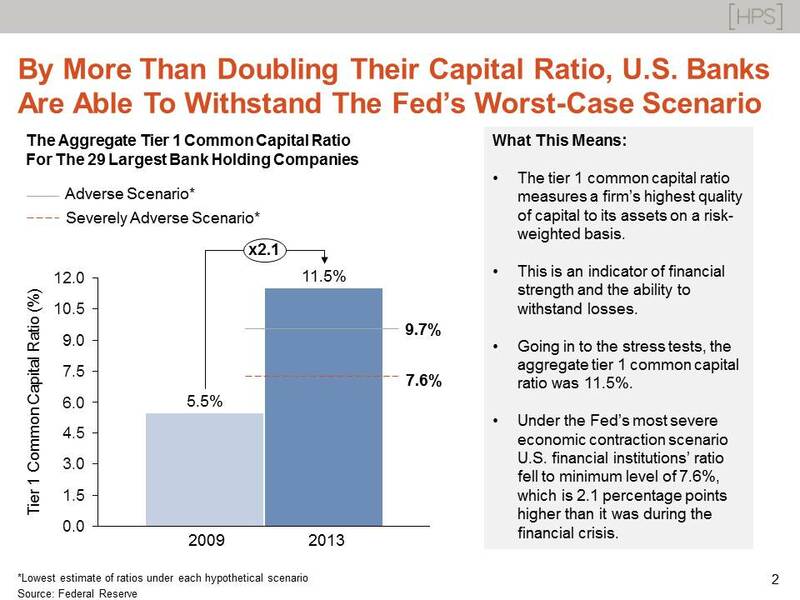 With a capital ratio that more than doubles the 2009 ratio, the 30 largest bank holding companies (BHC’s) maintained an average capital ratio of 7.6 percent under the most severely adverse scenario. This is well above the regulatory minimum of 5.0 percent with only one BHC falling below the minimum. A global market shock affecting a broad range of risk factors. The domestic severely adverse scenario includes a decline in real GDP of nearly 4.75 percent between Q3’13 and Q4’14. Additionally, there is an increase in the unemployment rate to 11.25 percent, a 50 percent drop in equity prices, and a housing price decline of 25 percent. Internationally, the severely adverse scenario features recessions in the Euro area, the United Kingdom, and Japan. There is also below-trend growth in developing Asia.